With Thanksgiving and winter holidays now only weeks away, chances are you’re gearing up for more family time — and more, or bigger, family dinners — than at any other point during the year. While holiday planning can sometimes bring its own special stresses, it’s important not to overlook the main reasons for our gatherings: thankfulness, togetherness, love and connection among them. If you’re finding yourself worn out physically, emotionally or spiritually, and you could use a little motivation to get you into that grateful frame of mind, check out our favorite resources for this most family-centered time of year. The rituals involved in family gatherings are important for our health and well-being. How good? Dr. Anne Fishel and three other family therapy experts explain in this Expert Roundtable. Among the reasons to gather with family at the holiday table are the stories we tell, which have been shown to foster resilience in children, setting them up for better mental health into adulthood. Read two perspectives on the importance of passing our stories down through the generations — and tips for doing that at the table — in Thanksgiving Storytelling and The Food Tells the Story. Each year, we join #GivingTuesday in proclaiming the Tuesday after Thanksgiving (this year, November 28) an international day of giving! You can use our specialized resources for families to make giving back a central theme of your dinner table on November 28, at Thanksgiving dinner itself, or any day of the year. 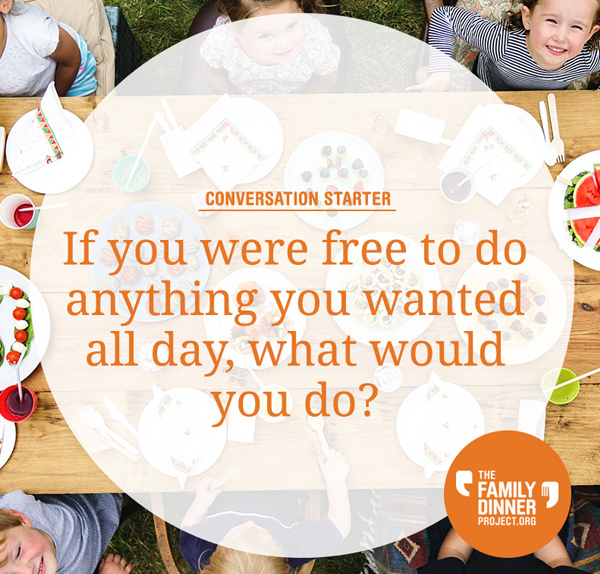 Tension at the table can be a challenge no matter the time of year, but add in the pressure of a big family gathering, and it can really cause dinnertime anxiety. Make sure your holiday gatherings remain respectful — and fun! — with our tips and tools. Above all, keep in mind that holiday gatherings should be fun and memorable, not strained and stressful. Do what you can to slow down and focus on the positives! Meet the Burroughs family, who have been members of The Family Dinner Project since 2012! Bookmark these Thanksgiving leftover ideas for the day after the feast. Break the ice at big family gatherings with this fun group game! Help others get the conversation started this season — pass on some of our Conversation Shareables!